EQ is an award-winning chartered financial planning firm with over 60 staff in London and 2,000 clients all around the UK. Our emphasis on doing things the right way has struck a chord with people who are tired of being treated as numbers by organisations only interested in growing their profits. We are one of the fastest growing wealth managers in the UK but we won't be selling out - we are committed to being a staff owned business. For more than 30 years I have set out to provide a rigorous research based approach to investment, coupled with excellent client service. That approach worked well at Bestinvest, which I founded in 1986. It became one of the most successful companies in the sector and set standards that have now been widely adopted. Those principles are just as valid today and form the core of the EQ philosophy. We make every effort to align our interests with those of our clients. EQ Investors is wholly owned by our staff, which means we are not chasing targets for growth set by external shareholders. Our main objective is to win praise for service and the value we have created for clients. Our investment team is packed with talent and carrying out some of the best research that I’ve seen. Our financial planners are also highly qualified and well placed to help clients achieve their goals. We already advise thousands of clients and have a thriving business that seeks to be the best, not the biggest. I’d like to invite you to become a client of EQ and to help you achieve what you want with your money. In Wealth Management Big does not necessarily mean Better. In fact it often means the opposite. EQ is large enough to provide a full range of services but small enough for every client to feel important and to unearth the hidden gems that often generate higher returns. Unlike many of our competitors we have no external shareholders, nor do we have any intention of ever selling our business. That means we can take long term decisions unhindered by any requirement to meet financial targets. You can be confident that there will not be a change of ownership in the future and that the person you deal with at EQ is likely to be here for a long time. 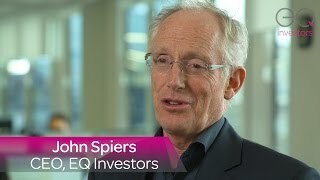 EQ stands for Emotional Quotient, a measure of our ability to recognise people’s emotions. It reflects our intention to treat all people: clients, staff, suppliers, as human beings and to value their feelings. The interests of our clients always rank ahead of other considerations. We aim to win awards for the quality of our service and our investment performance, not our rate of growth. We are looking to establish lifelong relationships with clients, not just an initial transaction. At EQ we have a strong sense of being a member of a wider community. We are proud to be one of the first UK companies to be awarded B Corporation status, an internationally recognised standard for companies that believe in business as a force for good. We operate a Matched Giving programme to help our clients and staff raise extra funds for their favourite causes and we have set up the EQ Foundation as a registered charity. 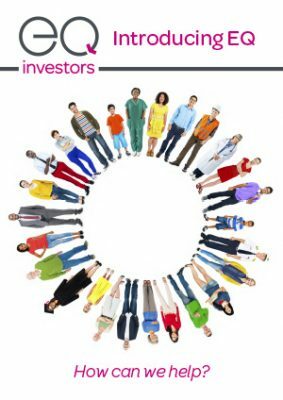 Our Positive Impact Portfolios are a unique proposition for clients who care about how and where their money is invested.